In late-September, President Donald Trump and Japanese Prime Minister Shinzo Abe announced that the United States and Japan will enter negotiations on a trade agreement. On Oct. 16, the Office of the U.S. Trade Representative formally notified Congress of the Trump administration’s intent to negotiate a trade agreement with Japan. USTR is also required to publish objectives for these negotiations at least 30 days before formal talks begin and will hold a public hearing seeking input on these objectives on Dec. 10. 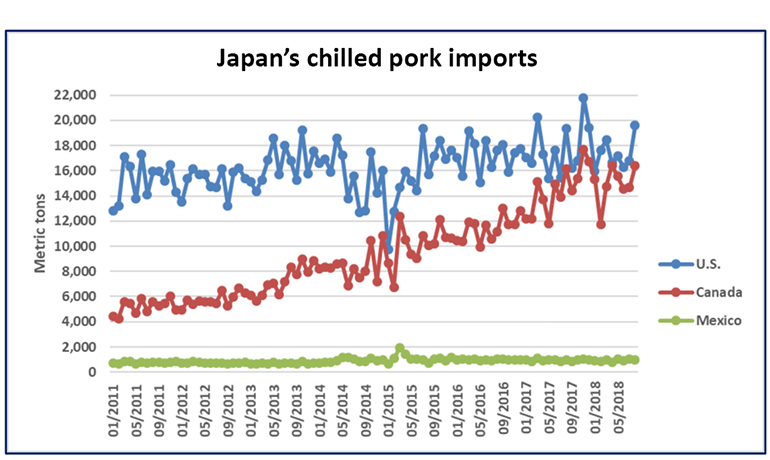 The success that the United States and other pork-exporting countries have achieved in Japan has come despite a rather complicated “gate price” and import duty structure that raises costs for importers and, ultimately, Japanese consumers. All major pork suppliers have faced these same obstacles in Japan — but this will soon change. Japan is a participant in the Comprehensive and Progressive Agreement for Trans-Pacific Partnership — sometimes known as “TPP-11.” It is the successor to the Trans-Pacific Partnership, which counted the United States among its 12 participants until President Trump withdrew from the TPP in January 2017. Under CPTPP, Canadian pork will gain significant tariff relief in Japan, while Chile and Mexico will benefit from even deeper tariff cuts than those included in their economic partnership agreements with Japan. For example, U.S. or Canadian chilled/frozen pork currently entering Japan must clear the gate price of 524 yen per kilogram ($2.10 per pound) and then pay a 4.3% ad valorem duty ($0.09 per pound). Any load valued below the gate price must pay the difference between the gate price and the load value, or a maximum specific duty of 482 yen per kilogram. Minimal trade occurs below the gate price because of the high tariff costs. After Dec. 30, the U.S. rate remains the same, but the Canadian product will be assessed a 2.2% ad valorem duty (which will drop to 1.96% on April 1) for product clearing the gate price, meaning a tariff of about 4 cents per pound (at current exchange rates). In addition, imports of product below the gate price would be charged a maximum of 125 yen per kilogram ($0.50 per pound) plus the 1.96% ad valorem duty. For processors seeking the most affordable raw materials or retailers seeking opportunities to feature cuts when prices are seasonally affordable, trade in specific cuts valued below the gate price could develop. It will take time to fully understand the impact of these changes to the maximum specific duty, which drops to 70 yen per kilogram in 2022 and to 50 yen per kilogram in 2027. But it is certain that U.S. pork’s competitors will immediately benefit from lower tariff costs upon implementation of the CPTPP, and that Japanese customers are evaluating the potential changes and how to grow their business with CPTPP members and European suppliers. Canada is U.S. pork’s largest competitor in Japan’s chilled pork market, but the largest supplier of frozen pork to Japan is the European Union. The recently completed EU-Japan EPA, which is expected to enter into force near the end of 2018 or in early 2019, will extend the same benefits to EU pork. Assuming the EPA is implemented before April 1, the tariff reduction scheduled will be similar to the CPTPP, with the first round of reductions taking place upon implementation and the second round taking effect April 1. Examples of European pork products that will quickly gain a large advantage in Japan are ground seasoned pork and canned pork products. Japan’s 20% duty on these products will be cut to 16.6% upon implementation of the EPA, and will further decline to 13.3% on April 1. In preparation for implementation of these agreements, some Japanese companies have already shifted purchases of ground seasoned pork. 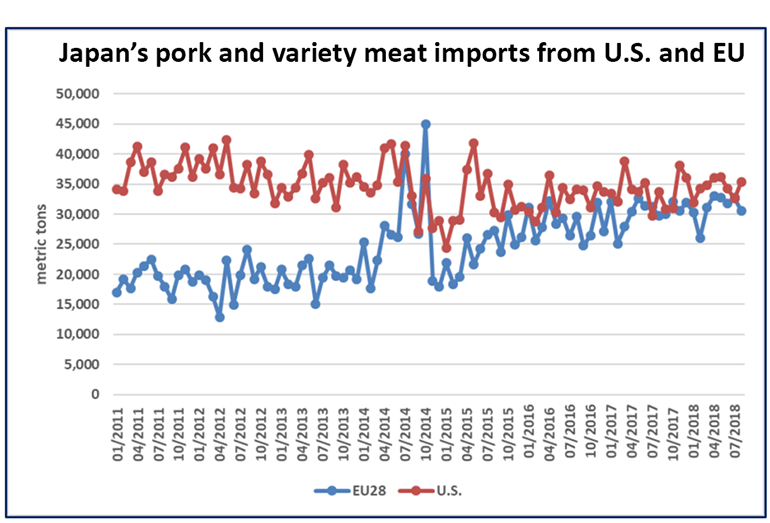 For example, imports of European ground seasoned pork have captured 17% of Japan’s imports this year, up from 12.5% last year and from virtually zero in 2012. Imports of ground seasoned pork from Canada, Mexico and Chile have also surged this year. Imports from the United States have increased 4% in 2018, but market share still dropped from 72% to 65.5%. Similarly, Japan will import more finished processed pork products as duties on ham and bacon are phased out, and the United States will miss out on tremendous opportunities unless a trade agreement is reached with Japan.